We had a friend bring a light meter in which appeared to be dead-we thought we could fix that! 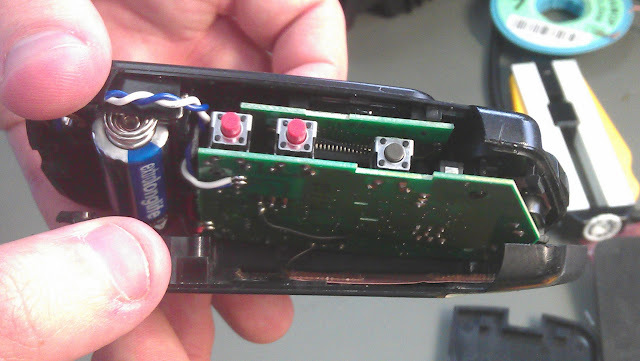 The controller should activate the flash on a button press, but wasn’t doing this. However, everything else on the unit seemed to be operational, with the screen working and the buttons working. 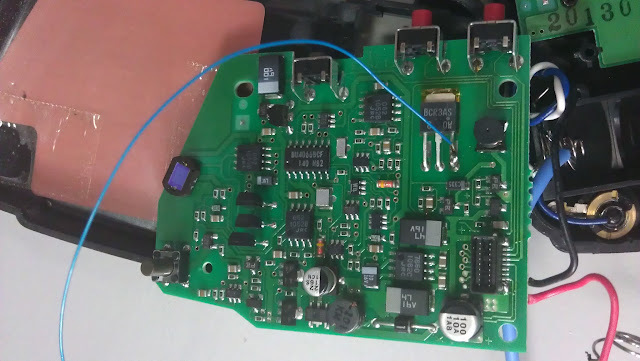 We assumed something was wrong with the switching mechanism itself, and after taking the unit apart, we traced the wires from the outside connector to the printed circuit board. These led to two of the pins of a three pin TO-220 type device which we assumed was some kind of switch, maybe a MOSFET. Keeping our fingers crossed for a simple problem, we tried a continuity check from the connector to the leads of the component-all was well, so back to troubleshooting! So the next step was to put the part number into octopart.com and see if we could find a datasheet. As it turns out, the part was a triac, a good choice for a high voltage, short duration switch, and it’ll automatically switch off when the current reaches zero. The gate was connected through a basic isolation circuit, to the pin of an MCU. It was unlikely that the simple passives under light pulsed loading would break, and if the MCU had broken it would likely affect more than the flash. 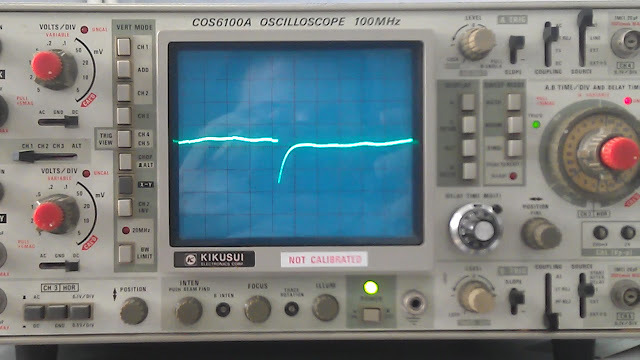 We know that a short positive or negative pulse will trigger or turn on a triac, so to test the rest of the circuit, we could just watch the gate with an oscilloscope and see if the expected pulse appeared. We read the datasheet to see what magnitude pulse is needed to turn on this triac which turned out to be 0.7V. We then soldered a kynar wirewrap (very thin) wire to the gate of the triac so we could observe the pulse on an oscilloscope. As we only had an analog oscilloscope to hand, we pulsed the signal repeatedly until we could observe the magnitude of the pulse. The pulse was sufficiently high voltage to activate the device, so we presumed the triac was broken. To confirm this we used a dummy load with a bench power supply and resistor, and tried to switch this. It did not turn on. It was then confirmed that the triac was broken. We had one kind of triac around, so we got the datasheet. It indicated that it should turn on with the voltage pulse that the board was producing. 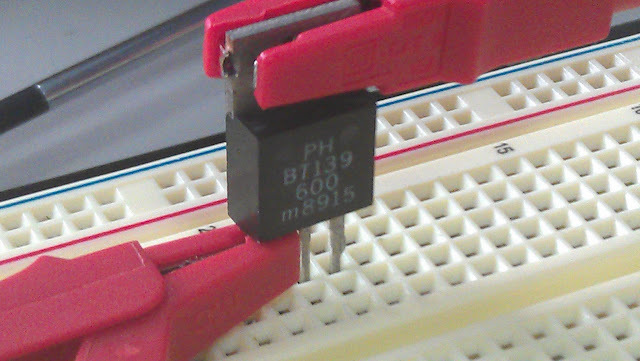 We then connected up the flash to this triac, in a breadboard. Using the bench power supply this time to replicate the pulse, we fired the flash using the new triac on the breadboard and confirmed that it would be a suitable replacement. Using the vacuum desoldering station and some solder wick, we removed the old triac. After confirming that the pinout was the same on old and new devices, we then inserted the new triac. It wouldn’t quite fit, so we bent the leads underneath the package until there was no risk of shorting, and the package did not protude from the board. A quick test was then performed, the light meter worked, so a full reassembly was completed and the flash fixed.